Subtitles originate from screenplays or transcripts with the sole aim of helping people better understand what is going on in a scene. They are great especially when video is done in a language that you do not understand. If you are French and want to share videos with people who only understand English, you will have to add subtitles to your video. Yeah, subtitles elevate the viewing experience. The only problem is, where can you get them? There are many online sites that are well suited for that and this section will discuss the top ten to find in the market. Read More: How to add subtitles to video permanently? The search for subtitles in this site is very simple once you know the right name and title. All subtitles are created and uploaded by users, which means you can often find matches even for obscure titles. Furthermore, you will have the choice of using language to sieve your results to a manageable number. If you want to upload a movie subtitle or even rate it, subscene.com will allow for all that. Nearly all of Subscene's subtitles are in SRT format. You can set a search filter to limit results to certain languages (up to three maximum), and you can decide whether or not you want to include "hearing impaired" subtitles (for sound effects). You may also find the forums to be a nifty feature. There you can request subtitles for shows and films - perhaps there aren't any in your native language or none that are correctly synced for your version of the media. For starters, the interface is cluttered, noisy, and hard to navigate. Furthermore, every single subtitle download redirects you to the Open Subtitles MKV Player, which is shady at best. I don't trust them enough for that. The user experience is lacking, to say the least. But there's a reason why Open Subtitles is so popular: it's the largest subtitle database with support for dozens of languages. If you can manage to find your way around the site, you'll see that there are subtitles here that don't exist anywhere else. 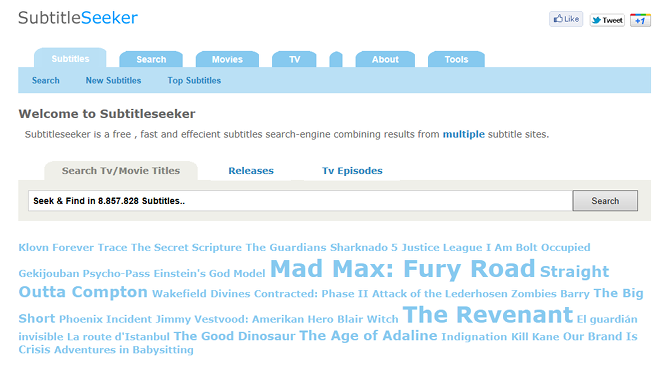 SubtitleSeeker is basically a metasearch engine for subtitles. Rather than tracking its own database of contributed subtitles, it pulls in and combines results from over 20 different subtitle sources. You won't find a more comprehensive search tool anywhere else. Perhaps the biggest selling point of SubtitleSeeker is its clean interface - arguably cleaner and easier to use than Subscene's interface. 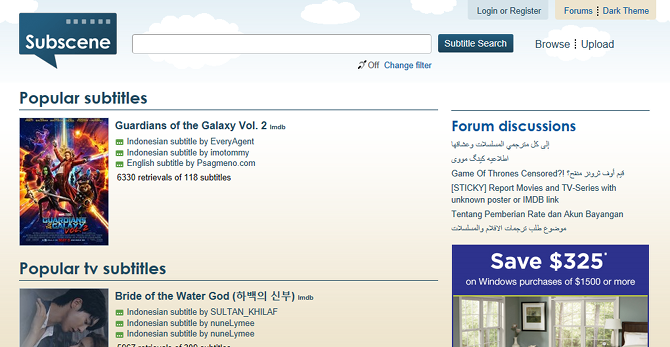 The main page has a search bar, a word cloud based on most-searched terms, and lists for most popular subtitles (one for films, one for shows). The above ten sites are great, and I absolutely recommend them when you need subtitles for whatever you're watching. However, if you're like me and you prefer subtitles for everything, then downloading them by hand can get cumbersome after a while. So what if you could cut out the website visits? A handful of free media players support searching for subtitles directly within the player, and some can even look up subtitles automatically based on the filename of what you're watching. Media Player.NET - Built-in support for auto-downloading subtitles using either XySubFilter or DirectVobSub. It's unclear which sites they're sourced from. BS.Player - Built-in support for auto-downloading subtitles, available in both the Free and Pro versions. It's unclear which sites they're sourced from. Media Player Classic - Built-in support for auto-downloading subtitles. By default, they are sourced from Open Subtitles. VLC Player (with VLSub addon) - Can search Open Subtitles and download matches to the current video, either by name or by hash (the latter is more accurate). No longer works with VLC 2.1.x, requires VLC 2.2.x series. PotPlayer - Can search for subtitles within the player and download the ones of your choosing. You can add your own source sites if you wish. Even if your video player app of choice doesn't support subtitle downloads, nearly all modern video players support automatic subtitle loading as long as the filenames match. Even though downloading by hand is inconvenient, it's a small price to pay for clarity.